Microsoft's new Zune HD media player will outperform and undercut the iPod Touch, according to an enthusiastic Redmond insider. Neowin has an interview with (probably) a Microsoft software engineer working on the new player, which is due for launch in September. 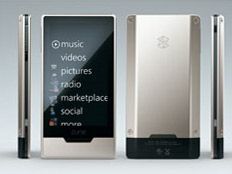 The source says that the Zune HD will launch in 16GB and 32GB versions, with a 64GB model arriving later on. Zune HD will be able to output 720p movies through a HDMI port, and its 3.6-inch OLED screen is reported to be fully multi-touch capable. The Wi-Fi iPod rival will also boast "improved" battery life and be able to download movies direct from the Xbox Live Video Marketplace. Neowin's Microsoft insiders says the base 16GB Zune HD will sell "somewhere in the range of $249 -$280", which would place it $20 cheaper than the entry-level $300 iPod Touch. He also says that: "Microsoft plans to have Zune interact with a variety of other Microsoft services." Quelle surprise.